This might not be a problem for everybody, but if someone has knee, hip, or back pain that is extension based, doing any exercise that extends us more can immediately cause discomfort. For example, if someone has extension based lower back pain, the moment they start to descend during the Bulgarian split squat they may start to feel discomfort. However, by utilizing “references”, you can potentially make the Bulgarian split squat pain-free because the references will keep their spines and pelvis out of extension. Before I get into the concept of references, a quick note about extension. Many people use extension patterns to stabilize their body. For most of us, we don’t do it consciously, and we probably aren’t even aware that this extension based stabilization is even a reality, or that it can be undesirable at times. I surely didn’t understand any of this until I found PRI. But I learned that if you take away someone’s extension based stabilization strategies, you completely de-stabilize them. This is because they were using “fake stabilization”. What I mean is that they were stabilizing through compensation. If a left hip isn’t stable due to lack of anterior glute medius, IC adductor, left hamstring, left internal oblique weakness, or anterior hip ligamental laxity, there is a good chance an individual will use extender muscles (psoas, low back) in order to stabilize the hip. This is not desirable. We want the proper musculature stabilizing that left hip. Once you remove the ability to extend to provide stability, you end up de-stabilized. At that point, seemingly easy exercises, like a body weight split squat becomes difficult. Although I’m not using any weight in this version of the exercises, what I am doing is not easy at all. The exercise becomes harder due to the fact that I’m not allowing my body to extend to stabilize itself. Extension patterns: supinated feet, locked knees, increased lordosis, forward head, external rotation of legs, are all methods that the body can attempt to stabilize us, particularly on the left, particularly when our body and ribcage have lost tri-planar motion. If you don’t allow an “extension-for-stabilization” minded individual to extend, they need a new strategy. They will feel completely unstable while doing this exercise. PRI is unique, not well understood, yet potentially life changing. Please consider sharing this information if you think it's useful. Thanks! PRI makes extensive use of references. References are like the stars for early navigational explorers. If you sailing the vast ocean you have no landmarks to give you your location. The only way you knew your position was by looking at the stars. The stars informed sailors as to where they were in respect to their environment. In this case, the ocean. Similarly, we rely on references to establish our body’s position in relation to our immediate environment and to guide our movements. Obviously our eyes provide the most sensory information, but so do our feet. Our feet tell our brain where we are in relation to the ground. Certain areas of our feet must be sensed, or referenced, by our brain in order for our brain to activate muscles appropriately. When we end up in a faulty postural position, we lose references. These areas become under-referenced areas. Conversely, references can also be areas of the body that are sensed too much and thus restrict proper movement. These would be over-referenced areas. For example, in the left AIC pattern, we often lose sense of our left heel and right medial arch. Our left heel and right arch become under-referenced areas. This under-referencing occurs because when a left pelvis rotates forward compared to the right, our weight becomes more anteriorly placed on our left foot (around the mid-foot area) and the flexed hip alters the way our left foot hits the ground as we walk. We no longer strike the ground properly with our left heel nor do we sense our left heel while standing. In addition, our center of mass is shifted more to the right. This “center of mass to the right” scenario means they many individuals will sense most of the weight on their right foot towards the heel and/or laterally. The right heel and right lateral border of the foot become over-referenced. Consequently, they no longer sense the inside of their foot–the medial arch–nor the right big toe, both of which become under-referenced. In regards to human walking, a right foot that feels all heel and lateral border is a supinated foot throughout the entire gait cycle. However, a foot should heel strike in supination, then pronate (which brings the medial arch to the ground) and then re-supinate. Re-supination allows us to push through our big right toe to propel us forward. doesn’t allow us to push our weight over to the left. will not push forward with the right big toe. Will prevent proper left hip musculature from turning on. Will prevent us from gaining a left ZOA. Will keep our neck in a Right TMCC pattern, and much, much more. In order to train pronation of our supinated right foot, we need to reference our right medial arch and right big toe. Over on the left, In order to attain and hold a left ZOA, we need reference from a left heel. Left heel strike is essential for non-compensatory (non-painful) effortless movement. Maintain proper pelvic and rib cage position on the left side. Proper position is always more challenging on the left side than on the right side because of the left AIC/right BC pattern. Activate left hamstrings, glute, and internal obliques. Without heel however, we get more calves, quads, hip flexors, and lower back and we will inevitably extend. Enable left posterior mediastinum expansion and left diaphragmatic power. The stick helps me to keep balance while referencing these two areas, but it also helps turn on my left abs and keep my upper body lateralized to the left. My upper body lateralization is important because when we want to reference the right arch/right big toe when our upper body is lateralized to the left as well as the left heel to maintain left lateralization. In the left AIC Right BC pattern, our torso is lateralized to the right. I covered this lateralization concept in depth in this post about the Horizontal Abduction test. We want to reference the right arch/right big toe as it is pushing our center of mass over to the left side. So by using the stick when our right leg is doing the work, we keep ourselves out of our typical right lateralized pattern. 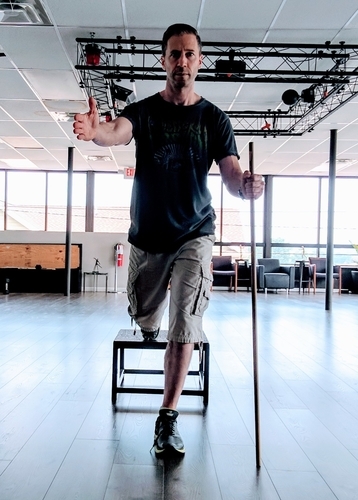 In addition, because my left hand is holding the stick, it helps prevent our weight from shifting to our potentially over-referenced right lateral border/heel of our right foot. Instead, it helps us reference the typically under-referenced right medial border/right big toe that we need to properly turn off our right adductor and turn on our right glute max, and it is the right glute max that serves to push our center of mass over to the left. In the left AIC pattern, not only do we tend to lateralize over to the right, we also don’t spend enough time on our left foot. Our torso doesn’t stay lateralized to our left long enough (even if we can get left AF/IR). Not only do we lack left lateralization quality, we lack quantity, too. This gait timing issue is a huge deal in PRI but it was one of the very last things I understood. I knew we had a hard time getting to the left, and I knew we have a hard time staying there (due to the influence of the right diaphragm), but I didn’t quite get the full picture until I understood the role of the left ZOA during dynamic activity. If we had four seconds of total “stance” time during gait, we’d like to have our left and right stance times to be equal. We’d spend two seconds on the left foot and two seconds on the right foot. This would provide for equalized alternating movement between the left and right sides of our body. However, this clearly is not happening with many people. Again, I’m using made-up values, but in my fantastical four-second gait cycle scenario people will spend three seconds on their right foot and only one second on their left. This is what a strong left AIC/right BC/right TMCC pattern can do to us. It causes us to spend too much time on the right foot and too little time on the left foot. For historical minded people, think of it as a conquering army. Along with “don’t fight a land war in Asia” and “don’t invade Russia” military leaders have always realized that conquering the territory (gaining a left ZOA) isn’t always the difficult part. The difficult part is controlling the conquered territory and subduing the unfriendly inhabitants (holding on to the left ZOA during activity and through the stress of normal human existence). In regards to gait timing, we have to teach ourselves to hold on to that left ZOA/left lateralization while our weight transfers forward over the left foot and our left hand swings forward. We don’t want our left pelvis to rotate anteriorly too soon or our left ribs to lose position in the frontal plane, otherwise we go right back into extension on the left side. By referencing our left heel, we begin to learn how to lateralize to our left and hold on to our left for a longer period of time. But to hold on to the left longer, we have to keep our torso from lateralizing to the right too quickly. It’s very easy to lateralize to the right when our left arm comes forward. Integrating our left abs via the stick helps us train this vital aspect of PRI. Just make sure your hand is low enough on the stick that when you descend your ribs aren’t forced to elevate. The exercise with referencing is performed the exact same way as you would normally do a Bulgarian Split Squat. You just sense the references as you do it. By referencing your heel, your lower back shouldn’t extend. If you want to include PRI breathing into it, you would inhale at the top and feel your ribs move backwards (rib expansion) and then exhale as you go down and up. You can include a visual component by making sure your eyes “scan” from side to side in front of you. We often fixate on a particular object or the floor in an unconscious attempt to stabilize ourselves while on one foot. However, visual stabilization often comes with a price: we can lose the ability to stabilize with the other systems of the body. 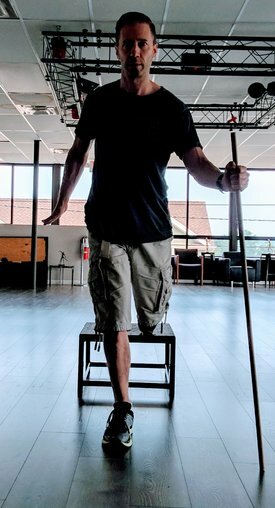 The moment you let your eyes scan, you’ll feel the difficulty of the exercise increase since you will now rely on your feet and muscles to provides all the joint stabilization you need. The fascinating thing about references, which are really just areas of your body that your brain relies upon to give it a sense of position in relation to our environment, is that they can cause huge amounts of pain when they are over-referenced. In April and May of 2018, I was on a foot discovery mission. I was using blue rubber shoe wedges, which I cut into little pieces, and stuck them on the underside of my feet so that I could reference areas of my feet that may have been under-sensed. One night I was messing around and had placed tiny blue pieces of rubber underneath my left little toe and right little toe. I then went to sleep without taking them off. In the morning, I removed the reference under my left foot, but the blue piece remained under my right little toe. The interesting thing about these references is that you sometimes forget that they are there because it’s almost as if your body incorporates them into your body. “my neck feels tight. Don’t feel good overall. I feel my left callus too much. My teeth don’t feel right. My foot is very uncomfortable. My thorax is cracking”. Well, it turns out that the little blue piece of rubber that was still under my right pinky toe completely pulled me into a painful situation. I realized my mistake when I got home, removed the piece of rubber, and did some PRI exercises. My discomfort went away shortly thereafter.